The Canadian Rockies are blessed with stunning scenery and extraordinary outdoor attractions. Visiting and participating in activities in these locations is subject to favorable weather conditions. The June 30 departure with Calgary extension features the Calgary Stampede. This morning, tour Vancouver, including the waterfront, Chinatown, and Stanley Park with its old-growth evergreen forests and totem poles. Catch the BC FERRY over to Vancouver Island and Victoria. Visit world-famous BUTCHART GARDENS, followed by a special dinner in the former historic greenhouse overlooking the gardens. 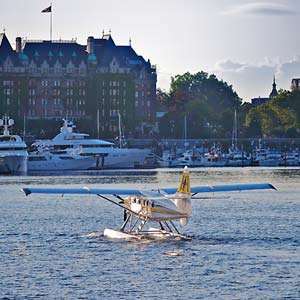 See major attractions on your city orientation tour including the Fairmont Empress Hotel, Bastion Square, and Thunderbird Park. 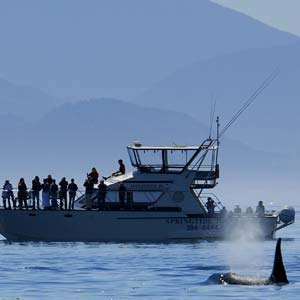 The day is free to explore on your own; your Tour Director suggests an optional marine wildlife and whale-watching trip. Shoppers will love Government Street’s elegant shops and Market Square’s specialty stores, while history buffs should be sure to visit the Royal British Columbia Museum. Today, board a BC FERRY and cross the Strait of Georgia and cruise through the spectacular Gulf Islands, an archipelago known for its Mediterranean-type climate. Stop at SHANNON FALLS, where a boardwalk leads to a viewing platform near the base of the roaring falls. On to the alpine resort of Whistler at the base of breathtaking Blackcomb Mountain. Time to explore the 2010 Winter Olympics’ sites. Today is free to explore all that Whistler has to offer. You might enjoy a trip on Whistler’s Peak2Peak Gondola, connecting Whistler and Blackcomb Mountains. Enjoy spectacular scenery and incredible photo opportunities as you travel via the longest unsupported gondola span in the world. Other options include a walk in the tree tops, a sightseeing excursion by air, shopping in the village, or just relaxing at your resort. This morning, enjoy a visit and private breakfast at the SQUAMISH LIL’WAT CULTURAL CENTRE, dedicated to the history and culture of the First Nations people. 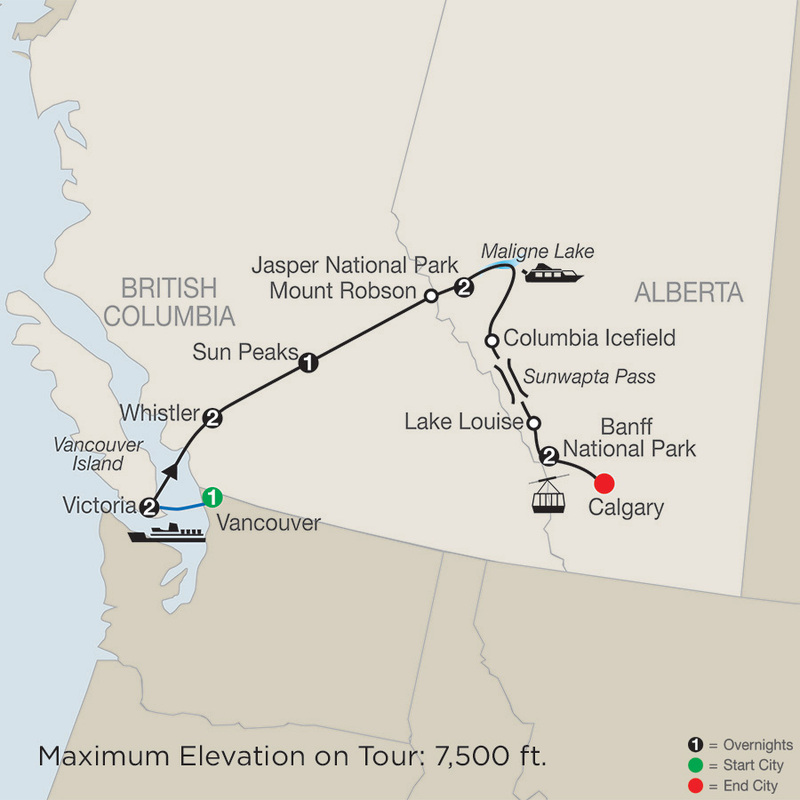 Then, journey north through the heart of the magnificent Cariboo region. Spectacular scenery abounds as you pass by rolling hills, deeply incised rivers, and sparkling lakes. Afternoon arrival in Sun Peaks with the balance of the day at leisure. 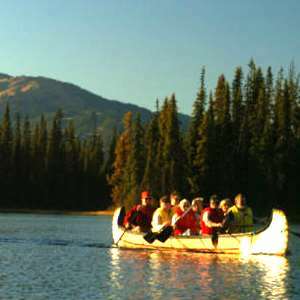 You may take advantage of an optional canoe trip on Lake McGillivray, where, surrounded by beautiful scenery, you learn about Canada’s fur trade. 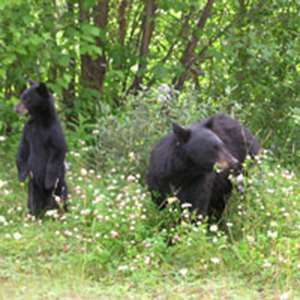 Continue north, following Yellowhead Highway and hugging the mighty North Thompson River, into the province of Alberta. See the base of 12,972-foot Mount Robson (the highest point in the Canadian Rockies) before entering JASPER NATIONAL PARK. Marvel at the precipitous gorges, snowcapped summits, and lakes of exquisite blues and greens in this wild mountain wilderness. 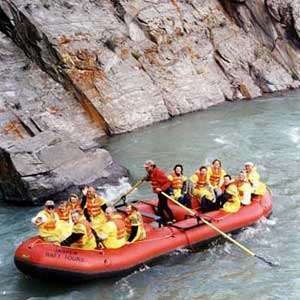 Before arriving at your hotel, perhaps take an optional float trip down the historic Athabasca River, where your experienced guide will navigate as you absorb the splendor of Jasper National Park. 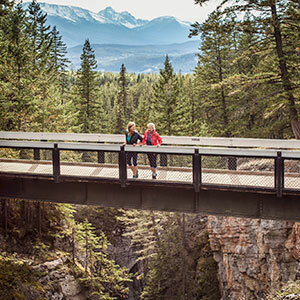 Enjoy a sightseeing tour to see Jasper’s unspoiled beauty. 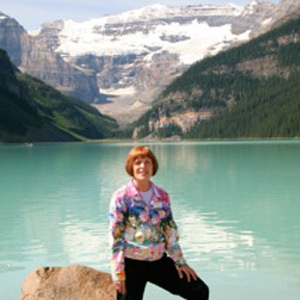 Afterward, travel to glacial Maligne Lake for a narrated CRUISE to Spirit Island. On the return journey, stop to view Maligne Canyon. Balance of the day is at leisure to explore Jasper on your own. This morning, travel through Jasper National Park on Icefields Parkway to the 750-foot-thick Columbia Icefield for a thrilling ICE EXPLORER RIDE. Climb Sunwapta Pass to savor stunning vistas of alpine meadows, waterfalls, and massive glaciers, then scale Bow Pass with splendid views of Peyto Lake. Next, stop at Lake Louise, whose green-blue waters form a perfect mirror reflection of Mount Victoria. Continue into BANFF NATIONAL PARK. Breakfast this morning is served on top of Sulphur Mountain. Take a scenic ride on the BANFF GONDOLA to the top of the mountain and then enjoy spectacular views of the valley below as you savor a flavorful meal. Additional sightseeing in Banff includes a visit to Bow Falls. The balance of the day is at leisure. 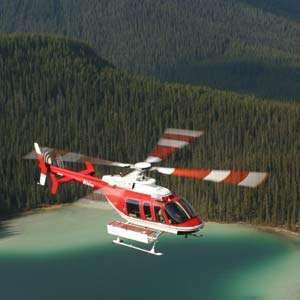 Consider an optional flightseeing trip for a bird’s-eye view of the Rockies. This evening, join your Tour Director for a farewell dinner. Depart Banff for Calgary International Airport. Airport transfers are provided. Please schedule flights after Noon. 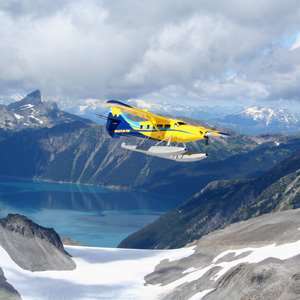 Experience a memorable seaplane flight over the majestic glaciers, rugged peaks, unique volcanic formations and lush alpine meadows that surround the turquoise waters of mile-high, 1000 foot deep Garibaldi Lake. Journey high among the treetops on this guided interpretive adventure through a spectacular network of suspension bridges, suspended stairways, boardwalks and trails on this Tree Trek Canopy Walk. Operating in a true old-growth temperate rainforest, your Whistler zipline journey takes you through the forest via suspension bridges, treetop observation platforms, ground based trails and ziplines. 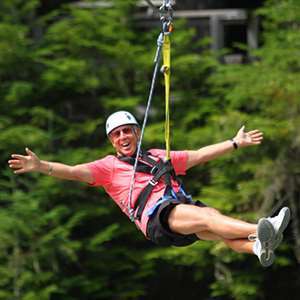 Choose from three different zipline excursions. Enjoy a guided voyageur canoe trip on Lake McGillivray followed by a 4-course Fur Traders Feast.